The Rule of Thirds is a compositional rule in photography and other visual arts. The rule states that an image can be divided into nine equal parts by two equally-spaced horizontal lines and two equally-spaced vertical lines. The four points formed by the intersections of these lines can be used to align features in the photograph. This aligning of a photograph’s subject with these points creates more tension, energy and interest in the photo than simply centering the subject would. However, like the Pirate’s Code, the Rule of Thirds is more like a guideline than an actual rule. 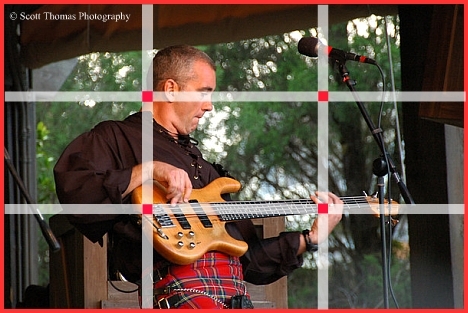 Above is a photograph of Off Kilter’s Bassist, Mark Weldon, entertaining guests at Walt Disney World’s Canadian pavilion, where I am showing you how the Rule of Thirds applies. (Note, it’s not exact as I hand drew in the lines but it’s close enough for our purposes.) Notice in three of the four intersections there are strong subjects close by: Mark’s tilted head in the upper left and both his hands in the lower two. The intersection points are called Power Points. Another popular mistake people make is putting the horizon right in the middle of their picture. Effectively dissecting the image in two. You should try to put the horizon at either the upper or lower third of your viewfinder when composing. That way you emphasize either the sky or the land. How does the Rule of Thirds apply to this photo? See article for an explaination. 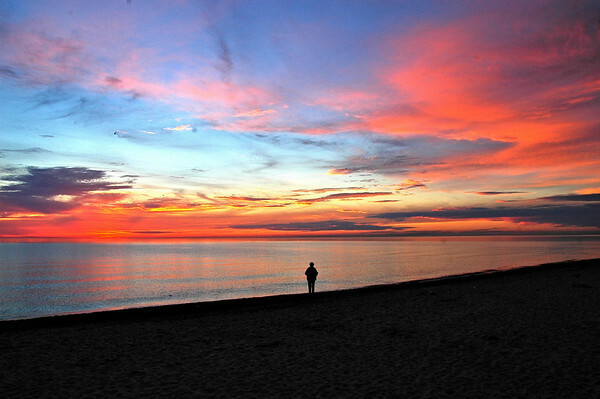 In this sunset photo, the person is standing in the middle of the frame and the photo doesn’t seem to fit the Rule of Thirds. Ah, but it does! The person is along the lower third of the frame while the water and sky fill the upper two thirds. By practicing the Rule of Thirds, you’ll find yourself thinking a bit before pressing the shutter. Recomposing in the viewfinder or retaking an image after looking at the photo you just took. The fun of digital photography is how easy and fast it is to learn to take better pictures. Another fun project is to review past photos which you thought were okay, crop them using the Rule of Thirds and see, if by doing so, makes them better. 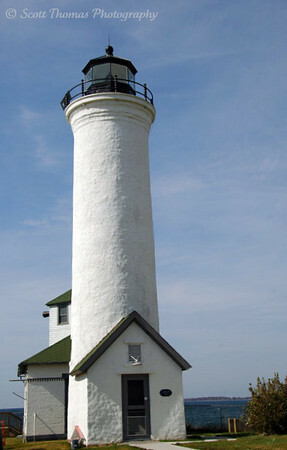 Rule of Thirds: Tibbet's Point Lighthouse, Cape Vincent, New York. 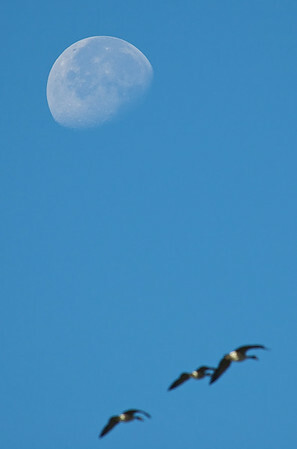 Rule of Thirds: Morning Moon over Beaver Lake Nature Center, Baldwinsville, New York. This entry was posted in Photography and tagged "washington, bath, beaver lake nature center, dc", england, lighthouse, lincoln memorial, moon, new york, off kilter, palladian bridge, rule of thirds, sunset, walt disney world. Bookmark the permalink. I pay attention to “thirds” in framing as I can, in cropping when I can’t, and often toss it out altogether because I’m busy trying to show you something–to document. I’d never read about the “power points” before. That’s interesting–and useful. Looking at the examples was instructive. You know I had to love the sunset, but the image that I found most pleasing was the bridge. It “felt right.” Or maybe I’m just a sucker for pastoral English scenery! 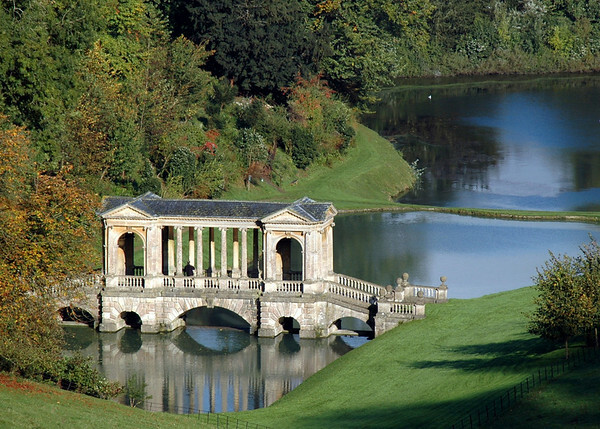 The Palladian Bridge photo was my favorite from that trip, Gerry. So glad you liked that one. Hey, I understand having to crop for editorial purposes. I do the same when I need to. This rule is for when you are behind the camera to start with a good composition. Cropping using the Rule of Thirds, if for presentation, printing or art, will help to improve the final product more times than not. Hi Scott – you know, I never could quite understand why the guys in Off Kilter in the Canada Pavilion wore kilts until I saw the opening ceremonies of the Olympics! 🙂 Now it all makes so much sense! Great topic, but if you keep doing this I’ll never have one to “guest blog” on! 🙂 P.S. The composition of the Abe Lincoln image is outstanding! LOVE the use of negative space there! Off Kilter is great. I have all their CDs and watch them a few times during stays at WDW. Syracuse, NY has an annual Irish festival and they usually have one or two bands playing Celtic Rock. Interestingly, after learning awhile ago about the Rule of Thirds, I started noticing it constantly…especially when watching films. The most beautiful cinematography attends to the Rule of Thirds as well. Who knew this “guideline” was so important?! Thanks Scott…always love your instructional pieces. That is so right, KD. Movies, TV, commercials, print ads…they all use this rule and put important products, things, information, etc. in the places people tend to look at when viewing an image(2). The old masters found and perfected the rule. Lovely post. The Palladian bridge is a stunner. Thank you. I hope to visit your country again. There are many places and pubs I’d like to photograph and experience. Thanks Scott, this is interesting and helpful to me, I need to pay more attention next time. Once you start seeing the compositions, it becomes second nature. Does your camera allow you to put up a grid in the viewfinder? Many do in which the view screen has faint lines like my illustration here. Scott, my camera’s viewfinder has dots that if I were to connect them in my mind, I can see the grid line,I have a Canon XTi. I went back to look at my old photos, and the ones that I shoot with the rule of thirds (I didn’t realize at the time)came out much better, now I know to pay attention, thanks. You’re welcome, Nye! Knowing is half the fun. It does work. Those are all terrific photos! Great post, Scott. I always pay attention to the rule of thirds, too, and it really comes naturally now. As the non-photographer, first let me say these are beautiful shots. Second, I actually get the concept of Rule of Thirds, believe it or not, and I see it in every picture above except for the lighthouse; can you explain that one a bit more? I’m not sure if I see the rule of thirds in the lighthouse shot other than it is off center. Also, aren’t there occasions, say for example in the sunset shot, if the sky was devoid of clouds, when you would position the horizon higher up, or is that the same rule only in reverse? Yes, normally I would have put the horizon lower in the frame on the sunset photo but that would have put the person way too low. The person was the main subject for me and I wanted to emphasize him. The photos says different things to different people. I like that. Who me, have a go at you? I would never! And I have to admit Scott, I’m still missing the concept on that lighthouse, but that’s okay, as it’s still a cool shot. That is very interesting post. I must pay more attention to this rule. Some pictures do not feel right sometimes, maybe that is why. Thanks for explaining about the lighthouse, a bit of a mystery to me too. I will practice and see how different my pictures look. 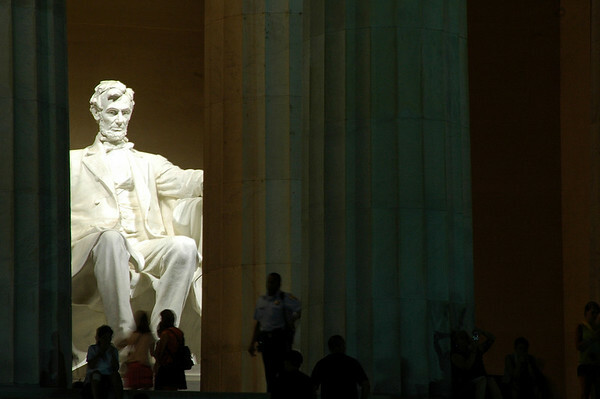 Beautiful pictures you shared, Lincoln Memorial’s image is just superb ! Interesting! I never knew about this guideline before. I’ll have to check if my camera has a grid. I will try to take my photos like this in the future, thanks!